So, you’ve decided it’s time to start saving money…GREAT! 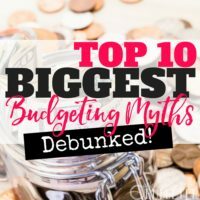 There are literally hundreds of ways you and your family can cut your budget left and right without feeling like you’re making huge sacrifices. 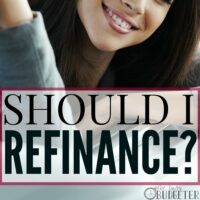 There are just so many things we spend money on for convenience or just because we don’t know there’s a cheaper alternative available (or we haven’t even weighed out our options). These little ways to save money can really help you save big-time! When I first started working from home, I knew we were going to have to come up with a plan to really ramp up our savings. We had some really important goals (like getting out of debt and simply make ends meet on one regular income) and to be honest, I wasn’t sure how we were going to make that happen. 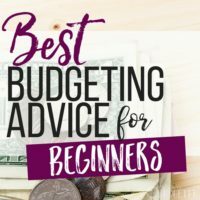 I’ve always considered myself pretty frugal, but I was surprised at how many simple ways to save money I found when I really started looking. There are ways to save on utilities and ways to save on food and groceries, and we even found discounts on entertainment. There were so many ways to save money! Now, there can be a real tendency to want to take on everything at once. Then what happens? You try to “do all the things!” and you end up discouraged and overwhelmed when you hit a roadblock or bump in the road. DON’T GET DISCOURAGED! Take small steps. Pick two or three items off this list to start, and see if you can painlessly implement them into your weekly routine. I want you to be successful and to then be able to build off that success to keep your momentum going. It isn’t about sacrifice and punishing yourself because you need to save money or get out of debt! It’s about finding easy and simple things you can incorporate in and use to modify your existing habits and routines. 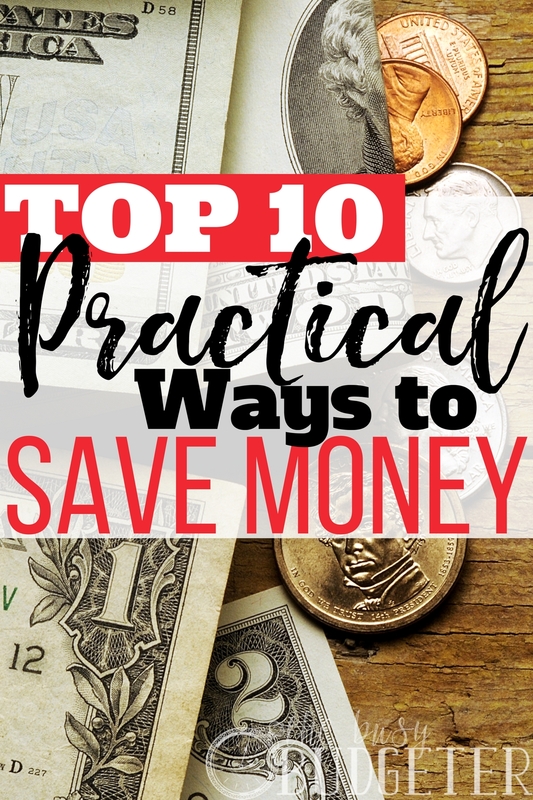 To get you started, I’ve picked my top ten practical ways to save money that I’ve found the MOST helpful. I’ve also included links to some related posts, if you need more help incorporating each idea or expanding on it. You can also check out The Ultimate Money Saving Checklist, which features 200 ways you can start saving money today. If you’re ready to start saving in new and easy ways, you NEED this list. This is easy once you get started, and you can totally set yourself up for success by making your lunch items ahead of time, purchasing a few snacks, and individually bagging them ahead. If you’re looking for a few lunch ideas, I have plenty to help you get started! Try starting with these cheap and easy lunch ideas for work. Buy used gym equipment for your house or join a free fitness meetup (find them on meetup.com or Facebook). If you’re attached to your gym (and you’re really using that costly membership), see if you can find other ways to save. For example, look into discounted rates, watch for Groupons and other deals, and renegotiate your membership fee whenever your gym is running a hot deal. Frugal weight loss is a real thing—and there are lots of ways to do it! Talk to your family about alternative gift exchanges at Christmas. We do a $10/person limit on one side of the family and a $100 Secret Santa on the other. For our children, we like the four-gift method (something to play with, something to wear, something to read, and something they need). Think a $10 gift sounds kind of sad? Think again! We have so much fun with our gift exchanges and we came up with some amazing basket ideas. Get creative and you’ll be surprised at how fun $10 can be. You’ll save money on groceries and time. Eating out can be a huge expense. If you do batch freezer cooking ahead of time, you can save yourself tons of time and avoid resorting to fast food and restaurants after a busy day. Freezer cooking can also help you stretch your grocery budget because you’ll be planning ahead and using up ingredients in several dishes. For tons of freezer cooking ideas, check out my post: 74 freezer meals you can make in just four hours! Meat is typically the most expensive ingredient in any dish, so eliminating the cost and replacing it with cheaper sources of protein once a week makes a big difference. If you’re looking for an awesome dish to start with, try Santa Fe Rice and Beans. This dish is so filling and so good, you won’t even miss the meat! “Light load” will effectively wash dishes that haven’t been sitting with food on them. This may seem like a tiny step, but it’ll save you money on your water and electric bills, and even help you use less detergent. Plus, keeping up on the dishes sets your whole day up for success. If you find you fall behind on dishes too often, check out the easiest routine to wash dishes and never get behind again. Know your store prices and search through the weekly ads as they come in. If you see a really low price, stock up with as many as you think you’ll use before they expire. (Consider your storage space when using this method.) There’s some planning involved, but check out this simple trick to saving tons on your grocery bill. There's also plenty of grocery budgeting tools and apps, like Ibotta and Favado, available for free on your phone. When you tell the people closest to you that you’re on a mission to save money, they’ll be more inclined to invite you to free or cheap events to support you. We often forget that entertainment doesn’t have to be expensive (or even cost a dime)! There are so many free and cheap sources of entertainment that will have you getting out, being social, and having a great time. After all, life’s too short to just sit at home all the time! Sell all the things you don’t love/need/want on Craigslist, eBay or Facebook yard sales. You can start your savings and really boost your income by simply getting rid of all the things you have on hand that you don’t want or aren’t using. Go through clothing, coats, games, sports equipment, and more. Sell what you aren’t using and you’ll end up with lots of extra cash (and a more organized house). That’s right, we’ve set a toy limit. My number is 30 per child, but only 20 toys (total, for everyone) can be out at a time. Sell everything else and exchange old toys for new when your kids receive gifts. This not only saves money, but it makes cleanup manageable for little ones. When you buy new toys, buy quality, because it’s one of the times being cheap can end up being crazy expensive in the long run. Get the full list of 200 Ways to Save by clicking here. It’s in an easy, checklist workbook format, so you can easily just check off items as you go. See how much you can save right away, and try to incorporate one or two ideas into your routine each week or month. In no time, you’ll be amazed at how many ways you can save! I love this list! It’s such a great reminder of the easy ways we can save money that often get overlooked. Because of you, I started washing my dishes on the “Eco Cycle” (my version of the light, I think). Hopefully it will save us some money, but if not I still feel better about doing the environmentally sound thing. I was also shocked about how much cheaper (and how much longer) store-brand dish detergent lasts. I’m still on a box I bought at Target quite a few months ago! Love simple ideas, love ways to save money! It’s amazing how the little things can add up to save, such as just not ordering soft drinks when we do go out to eat. I’m going to go bookmark your posts for freezer cooking and try that out on spring break, thanks for sharing! I am proud to say that I have accomplished many of the things on this list! Packing my own lunches was one of the first things that I started doing to save money. Not only does it save me money, I am also eating so much healthier during the work day than if I were to eat out. And though going to the gym is good for my health, I wasn’t going so I made the choice to nix the gym membership. I live in NYC so I am always walking around outside and pocketing the $50+ dollars a month just seemed like the best deal! Alexandra @TheHappyLifeFormula recently posted…The Women Living a Happy Life Project, featuring 8 empowering female bloggers! I already do many of the ideas on this list. I struggle with my grocery budget, though. The food bill for our two teenage boys, one ten year old boy, my husband and myself is more than our mortgage. Ouch! Wwe rarely eat out, and my hubby packs his lunch. We really need to work on cutting down on meat. I know this will save our family tons. As far as toys go, we limit our boys to three “categories” rather than a set number. We only buy them gifts for Christmas and treat them to a fun experience on their birthdays. Rules say, when you earn you got to pay a certain part of it as tax. These are government rules and one has got to abide by the rules and norms. Tax is a complex subject and most of us are unaware of it regulations set by the government.Those ways you described here to save money are truly amazing. I’m always looking for ways to save money, but I didn’t really think of meatless Mondays – I actually thought people did that just to be healthy, so thanks for the tip! Our dishwasher is a new addition to the family, I love it but I’m sure the costs are higher than washing dishes by hand as we’re on a water meter. Our Eco setting actually last for ages! I use the glass setting and it is the quickest one. I’ve only ever had to redo it once because it didn’t clean properly, every other time has been fine. I use the supermarket dishwasher tablets and they are less than 1/2 the price of the branded ones and just as good. 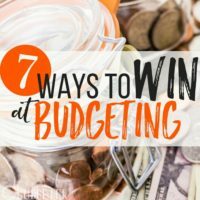 I love reading your blogs as i am big on saving money and your ideas help a lot. I just have to say – this was an incredible blog post and exactly what I needed. I am happy to read your article Money Saving tips. A simple and interesting thing you mention in your blog is so wonderful. Wow ! Ways of saving money that I never thought of previously…Simple yet practical.